City, MTA officially kill planned 7 stop at Tenth Ave. The Tenth Ave. station is no longer. 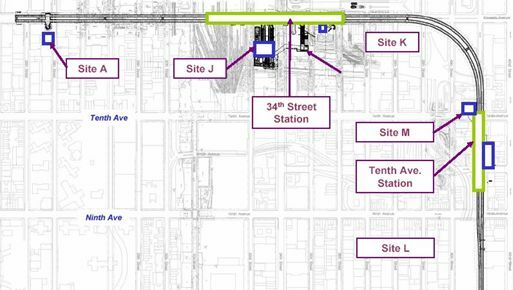 The MTA has scraped plans to build a station stop at 10th Ave. and 41st St. as part of the 7 line extension to the Hudson Yards area. Let’s not mince words: This is a terrible mistake. Transit officials dropped plans to build an additional 7 subway line station Thursday. Officials eliminated the plan to build a station at 10th Avenue and 41st Street when they were unable to obtain the $450 million to complete the project. I have long advocated for the inclusion of this station in the final project. If the city is going to spend the time and energy expanding west, they should be as inclusive as possible. To omit this station now would be to give up on it forever. Just ask proponents of the Second System. More alarming is the cost of this project and its ultimate result. The City and the MTA will now be spending a few billion dollars to extend the subway one stop. At a time when the system is falling apart, when maintenance projects are being deferred, when expansion plans are slowly crawling to a halt, spending billions of dollars simply to placate some real estate developer in charge of a project at least a decade away from completion doesn’t strike me as the best use of funds. Well said, Chuck. Well Said. – $1 BILLION discretionary tax rebate last year, knowing FULL WELL we were running into fiscal trouble. Bloomberg’s done a few great things, but by and large the man is an out of touch, egomaniac. And he wants a third term! 99% of his “PlaNYC” was recycled from existing plans and projects, cobbled together for a great press release and to give cover for Congestion Pricing. I still think tolling all the river crossings is the most effective means, combined with the millionaire’s tax (which Bloomberg opposes for obvious reasons) to pay for the transit improvements we desperately need. I can’t wait to get rid of this guy. He presided over the single largest building boom in NYC history, could have done some great things, but his priorities and ideology are fatally flawed. I think they had to make a tough choice with the 10th Ave station: costs a lot, especially in today’s economic times (and especially with the MTA’s huge deficit). However, I agree with neighborhood advocates: building later would mean costing and disrupting 7 service much, much more. And a good point there Ben about how the Upper East Side is “already developed.” Sure, we build subways to spur growth (as it is in Hong Kong), but we also use it to expand a commuter’s and resident’s connection to the rest of the city. If they don’t have the money for two stops, they should scrap the 34th/11th stop. There’s nothing there except a convention center, which is a destination for discretionary travel rather than commuting. Non-commuter stations tend to have dismal ridership: on the A, Howard Beach-JFK actually has less ridership than Far Rockaway; on the 7, Shea Stadium has the second lowest ridership, after Hunters Point. The M.T.A. just keeps on making mistakes including this one. Has anyone else noticed that the tile floor that is just being installed in the Columbus Circle Station is already quite dirty? They should have gone with granite like they used in the Times Square Station. The M.T.A. needs to stop trying to save money and focus on finding the funds to build and maintain a first rate system. “Already developed?” This is another reason why the MTA is no go and has to go. They don’t care about the people in New York City, they just care about lining their own pockets. Excuse me, but the “Already developed” excuse comes from Bloomberg, not the MTA. Old Chucky has 2 cents to add to anything that happens, but that windbag never has any solutions–he’s just a media whore. The map above has a silver glimmer off to the left margin. I mean, Damn. That tunnel goes all the way down to 25th Street! Yeah, I know they have to pull the rain through the station and turn it around. But that gets the tunnel almost to 14th St., where the tunnel for the L line also reaches far beyond the station at 8th Ave. With a gap of barely a mile, you could probably connect those tunnels for less than $2 billion — if you didn’t bother putting in another station, ha ha ha. And given that stations seemed to be priced at nearly half a billion dollars per, maybe it’s not to laugh. So could the #7 trains from the IRT line fit through the L line tunnel under 14th St. and head back to Queens someday? Probably after making a stop at new stations at 23rd St and 10th Ave and again at 14th and 10th?